Rising global temperatures will not significantly affect wind energy production in the United States concludes a new study. Rising global temperatures will not significantly affect wind energy production in the United States concludes a new study published this week in the Proceedings of the National Academy of Sciences Early Edition. But warmer temperatures could make wind energy somewhat more plentiful say two Indiana University (IU) Bloomington scientists funded by the National Science Foundation (NSF). "There are a lot of myths out there about the stability of wind patterns," said study coauthor Rebecca Barthelmie, a professor of Atmospheric Science at IU. Industry and government want more information about the long-term viability of wind as a power source before making decisions to expand its use, she said. Barthelmie and Principal Investigator Sara Pryor, IU's provost professor of Atmospheric Science, applied several regional climate models to assess potential future wind patterns in America's lower 48 states. They found warmer atmospheric temperatures will do little to reduce the amount of available wind or wind consistency--essentially wind speeds for each hour of the day--in major wind corridors that principally could be used to produce wind energy. "Areas where the model predicts decreases in wind density are quite limited," said Pryor. "Many of the areas where wind density is predicted to decrease are off limits for wind farms anyway." 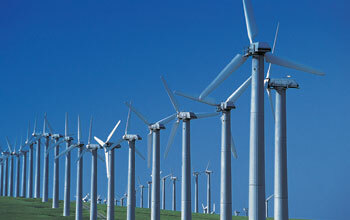 But there are areas that could see increased wind density and therefore greater opportunities for wind energy production, the researchers find. Those areas are atop the Great Lakes, eastern New Mexico, southwestern Ohio, southern Texas and large swaths of several Mexican states, including Nuevo Leon, Tamaulipas, Chihuahua and Durango. "There was quite a bit of variability in predicted wind densities, but interestingly, that variability was very similar to the variability we observe in actual wind patterns," Pryor said. Pryor and Barthelmie tested three different regional climate models for wind density, a calculation used to determine the best locations for wind energy development. The models were based on a future United States experiencing modest but noticeable climate warming of about 2 degrees Celsius relative to the end of the last century. The researchers compared their model predictions to past observations of wind density from 1979-2000. "The models tested show that current wind patterns across the US are not expected to change significantly over the next 50 years since the predicted climate variability in this time period is still within the historical envelope of climate variability," said Antoinette WinklerPrins, a Geography and Spatial Sciences Program director at NSF. "The impact on future wind energy production is positive as current wind patterns are expected to stay as they are. This means that wind energy production can continue to occur in places that are currently being targeted for that production." "The greatest consistencies in wind density we found were over the Great Plains, which are already being used to harness wind, and over the Great Lakes, which the U.S. and Canada are looking at right now," said Pryor. Such predictions could prove crucial to American policymakers and energy producers, many of whom have pledged to make wind energy 20 percent of America's total energy production by 2030. Currently only about 2 percent of American energy comes from wind.